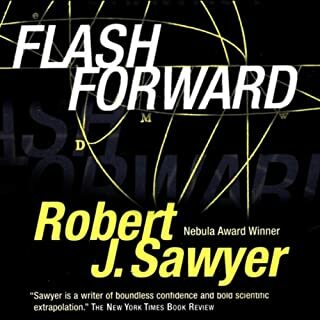 BONUS AUDIO: Author Robert J. Sawyer reveals the "secret history" of The Neanderthal Parallax trilogy. 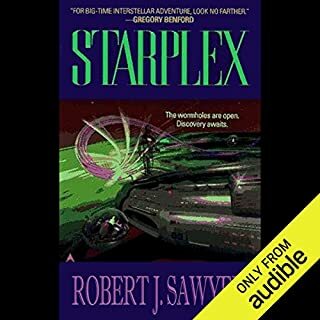 ©2003 by Robert J. Sawyer (P)2008 Audible, Inc. I liked the first book in this series a lot. The second one wasn't as good, but I still liked it. I was hoping that this book would redeem the second, but I thought it was terrible! I had to make myself finish it. There are so many things that were bad it's hard to know where to begin and I certainly can't list them all. The main female character, Mary, is often unreasonably bitchy and childish while the main male character (a neanderthal) is always calming her and being understanding of her petulance- it makes them both kind of boring. The writing was weak, there was hardly any character development. Well, we do learn that Mary seems to be quite the Star Trek devotee, several times connecting something in the story with a Star Trek episode - she knew the names of guest stars and who had directed. Perhaps Mr. Sawyer needed some filler and so he took from his own fanatical knowledge? According to the book, Americans are repugnant, there aren't very many American characters and none of them are good people. Throughout the series neaderthals are portrayed as having taken much better care of their world while we "gliksins" have ruined ours, which we have, no arguement there. But at one point the author compares neanderthals to Canadians and gliksins to Americans. Ok I get it, he hates Americans. Next sentence contains a spoiler: He also doesn't seem too keen on men (homo sapiens that is), so it's no surprise that the big villain in the book is an American male. Lazy, boring writing and I didn't like the narration either. Too bad, it started out as such a promising series. Would you try another book from Robert J. Sawyer and/or Jonathan Davis and Robert J. Sawyer ? Before this book, and to some degree before this series in general, I'd have said yes. I like some of their other books, but this was simply terrible. It fails in so many ways. Sigh... there were some OK parts, sections of the book that touch on science fiction. It all seems so forced though; those parts of the book were contrived and inexpertly jammed into a very bad story arc. It makes even the better scene's somehow feel outside the story. So disappointing; I'm not so much bitter, but just incredibly disappointed. This really isn't worth your time. This is the first negative review I've written in over 100+ books. Sawyer explains in an interview that Planet of the Apes was the inspiration for this trilogy, insofar as it used sic-fi to investigate then contemporary moral and political issues. I can definitely see the connection, but this investigation ends up being too didactic and simplistic for my taste. Pretty clear sense of good and bad and all that comes with that. Un-ending social commentary, not Sci Fi. This first book in this series was very good. 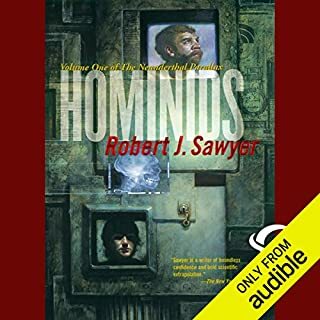 I love books about alternate timelines and this story about an alternate universe with Neanderthals as the dominant species was a great premise. However, the second and third books give up the science fiction and become social commentary books. In both the second and third installments are long dialogs about what I assume to be the author's pet peeves. Among the things the author seems to dislike are Americans, males, religions (especially Catholocism), conservative viewpoints, and personal ownership of vehicles and property, to name a few. His likes are women, Canadians, gays, lesbians, athiests, and environmentalists. SPOILER ALERT He also seems to come down heavily in favor of castrating rapists, which fits into his "woman are good, men are bad" mantra that he cyles over and over and over in his second and third installment. END SPOILER ALERT. Unfortunately, even if you agree with his viewpoints, his story is boring. There is not enough action, far too much commentary, and the main character, Mary, while competent in the first book, becomes shallow and vapid as the series progresses. I was charmed by the first book in the series. I too had problems with the second book. I did however pursue it to the end. The third book only maintained my attention for three chapters and I was finished. 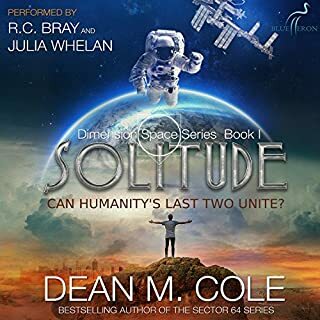 I enjoyed the first book in the series, and felt the second was OK, but was unable to finish the third, Trite character development, petty dialogue and predictable story line, made me stop the book by half way. Save your credits. Hybrids, none to be seen! Not quite what I expected. The novel was fraught with plots that it wasn't very clear to me what was important and was minutia. If there was an overall message intended to be delivered, it was lost on me. At best, the combination of love story, social commentary, and ecothriller felt like multiple stories weaved with naive preaching to me. If the sub-plots were to be thought of as episodes in a series, then I think it would more enjoyable as the plotlines can be compartmentalized yet run through. The entirety of the book was marred with uneven pacing between action and exposition towards the end. God is only in your Parietal Lobe! 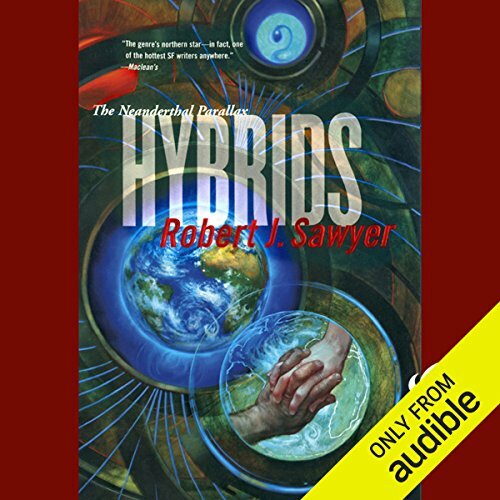 Where does Hybrids rank among all the audiobooks you’ve listened to so far? Would have been 31/2 stars overall but can't do that! Hybrids, the last book in Sawyers trilogy is a hit or miss for me. I'm secure enough to be able to read a book purporting to be sci-fi but that is more social commentary, that is 180+/- degrees from what I believe and or know to be true and to still see it for what it is, a book of fiction not fact. I think Sawyer goes overboard in maligning religious experience, miracles, UFO'S, after-life, and any other supernatural experience one might have had or think they have. Where big brother not only watches everyone, but lives with you daily and you're happy about it. Where generations are born every so many years so all grow up as the same age in a particular generation, certainly great birth control..Although this could have made for a great sci-fi book. Could have! But in my opinion, didn't. The sociology was so ingrained in this last book of the trilogy as to be trying to force a mind change on anyone who in reality (not just the fantasy world of the book), doesn't agree with it and that we're probably not as good a society/world as the Neanderthals. Which in a few cases we aren't compared to Neanderthal ideology presented. 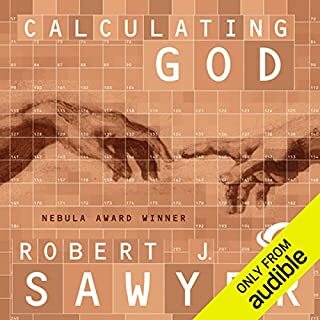 Sawyer's Calculating God, which I really enjoyed, had some of the god talk as well but in a more comparative way.. Letting the reader on their fantasy trip see more sides to a premise than only the one that Hybrid gives. For me, not one of Sawyers best. 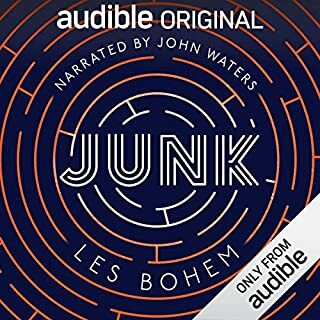 I'm not sorry I listened to it, it had some good science in it, especially quantum computers, but the end was really a let down for me on what could have been a great comparative analysis of parallel worlds. Hope this helps. If you are a very religious person of any faith, you may not want to listen to this. I doubt it will change your mind but I know you won't like the end. If you don't take offense easily about your beliefs in supernatural happenings, miracles etc. and especially religion and can see the social commentary for what it is...then you may enjoy the scientific parts of the book. I'm not sorry I listened to it. It's the fourth book of Sawyers I've listened to, but I do hope his other books aren't based on the same type/hype of social commentary! Read book 1 for sure, 2 is okay, but this one? No. I was surprised that this book turned out as bad as it did. I have read most of his work, including the two before this in the series, and was flabergasted by the hasty and poor execution. He had been fair through his other two books between atheism and theism - with balanced science on both sides of the arguement. For this one, it is an all out (amatuer) assault on religion as the source of everything evil in the world and it is all some kind of genetic defect. Can evil acts be blamed on religion? Sure, but everyone who studies more than transcripts of George Bush's speeches know that evil men grab religion as an exuse to get people to do things on faith. Faith doesn't cause evil, Mr. Sawyer, evil men do and then blame religion. What disappointed you about Hybrids? So as this is the final in the Hybrids series I was really disappointed in this. The main thing that got me was the change in the main character Mary Vaughan. She changed for this open scientific minded person to this judgemental person. Simple examples are how she wanted her views to be taken as fact by Ponter which looking down on his life style. I felt this was only written to give extra pages to the book and this simply didn't fit into what I had learnt about the characters over the 2 pervious books. Sadly this really made the book impossible to connect with. I found the first 2 great works and would have been happier if I had left it there. Have you listened to any of Robert J. Sawyer and Jonathan Davis ’s other performances? How does this one compare?